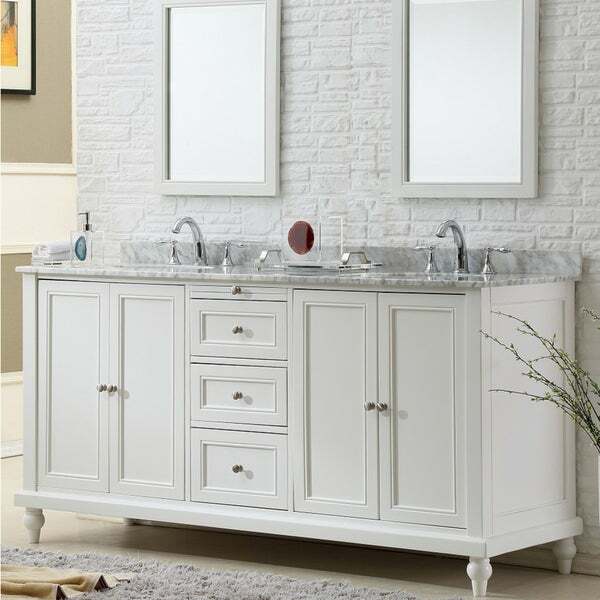 Bring a contemporary feel to your guest powder room or add luxury to your master suite with this Direct Vanity 70-inch cabinet. The pearl-white finish is cool and modern, while the sturdy solid wood construction ensures durability. With two shelves, three drawers and four doors, this vanity cabinet provides plenty of storage space for your personal items. Solid Wood on cabinet frame, legs, drawer box. Matching back splash will be provided only as a free courtesy, we do not warrant the back splash for matching characters nor breakage. 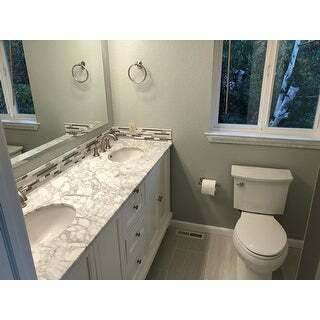 Such a beautiful vanity only problem is there is no guidance on how to install the marble top. 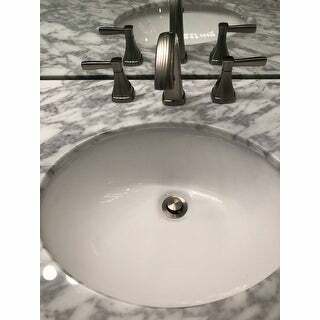 I paid my kitchen counter installers to set up this marble top and later I realized the back feet of the vanity are round and exceed the width of the back of the frame so if you align the marble with the back of the counter you won’t be able to push it flush against a wall. Not that big of a deal but my vanity is about 1-2 inches away from the wall. Lesson learned! 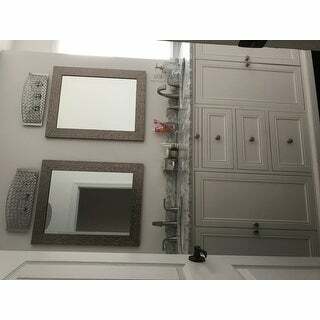 Beautiful Vanity - No instructions! This is a beautiful cabinet. Very pleased with the quality and style. The cabinet receives 5 Stars for sure! Our only concern is with Overstock, itself. The cabinet arrived without ANY installation instructions. We have contacted Overstock 4 times for assistance, and each time they assure us they will get the installation instructions to us within 24 hours... Then, we hear nothing from them after that point, until we call again. We have house guests arriving early next week, and unfortunately, we will have to share our master bath with them, because we cannot get the sink installed properly... three weeks after delivery.. Simply due to Overstock's poor customer service. While we are sure this is not the norm for Overstock... unfortunately, our experience has been costly and disappointing. 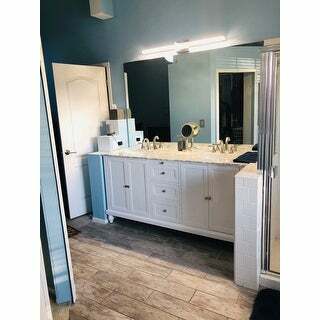 Really well made vanity and the marble top is beautiful! 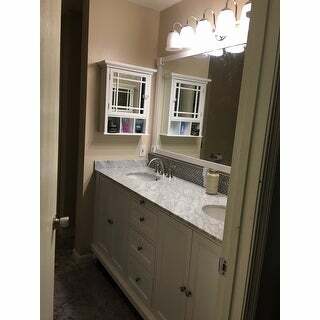 Great amount of storage space in the vanity and looks great in our remodeled bright bathroom. This is a very well-built solid wood vanity. It has a traditional look that could go most anywhere. I was very happy with this purchase. 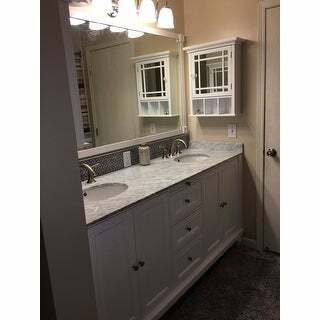 The vanity is pretty, but not great quality-- the doors are crooked and the "soft-close" drawers are not straight so they not only don't close softly, but they have to be forcibly pushed to shut. Buy from ***- better customer service. Vanity was delivered right on time. Since it’s big and heavy you will absolutely need help bringing it in. The height of the vanity was higher than I would have liked. Should have paid closer attention to that. It’s ok for adults but too high for kids. The countertop scratches easily so be careful. Drawers and cabinets doors both have the slow close feature which is great. Overall, good piece just keep in mind that it is high! 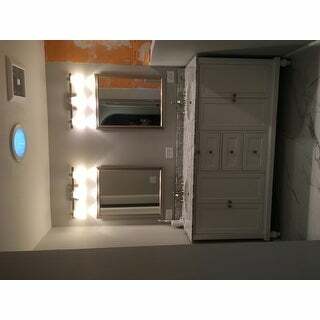 The vanity is even nicer in person and the marble countertop is beautiful. They did an incredible job packing it for shipment- it arrived in perfect condition. Absolutely love it and am very happy with the purchase. "Can the feet be removed?" "Can I get this with only 1 sink?" "What are the sink dimensions?" "Does the 36" height include the backsplash? Or is the vanity 36" from ground to counter top?" The 36 inches is from the floor to the counter top, it does not include the backsplash. "Is the countertop attached? " "I need to know if this vanity combo comes in 68 inches thanks"
"I would like to know if this vanity comes in 68 inches or 66 ??? Thanks"